The victory over the Trump administration lockout of Federal workers is a people’s triumph of collective action! Collective action creates the seeds for deeper and even more far reaching victories. 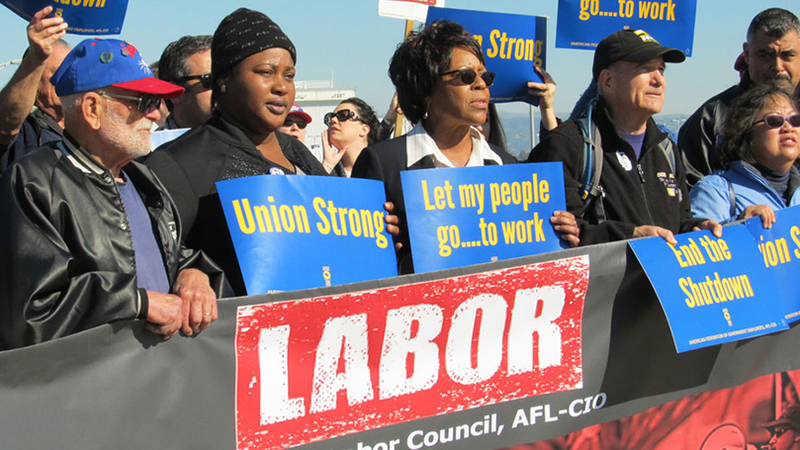 While much credit has been given – deservedly – to the fortitude of Democratic legislators led by the much-maligned Speaker Nancy Pelosi – the decisive role of the public workers’ unions has not gotten the attention it deserves. The Trump shut down had nothing to do with so-called “border security.” The month-long lock-out of federal workers, with its disruption of the lives of working class families, harm to our economy, and threat to public safety, was a continuation of the campaign to inject racist anti-immigrant poison into the American people, to divide and weaken our working class, and to shift attention away from the corporate attacks on living standards, Social Security, Medicare, and union rights. It was an effort to deflect attention from the deep corruption of this monopoly-capital-dominated administration, starring the most billionaire-heavy Cabinet in U.S. history. Public workers did not act as individuals in this fight. Through their unions they conducted a massive, well thought-out and systematic campaign to organize and mobilize their membership as well as to reach beyond them. They built a wide support base and carried out a solidarity fight all the way to victory. Both members and leaders of government workers unions, like those of the teachers’ unions across our nation, have been transforming their unions. Building on a wave of rank and file activity, these organized workers systematically reached out to families, community organizations and other allies in order to strengthen their movement and widen its mass base of support. Government worker unions also operate under the shadow of repressive anti-union legislation and threats of job loss, even federal prosecution, if they strike. 3) Mobilizing labor’s wide social and community base to materially offer food and other assistance to workers’ families during the lockout. AFGE leaders sat in at the Hart Senate Building. Denied the right to carry signs, they scrawled their demands on empty plates which they displayed as they submitted to arrest. In Kentucky, the union organized confrontations with Senate Majority Leader Mitch McConnell in his home state. Anti-union voices were muted, even in the reddest of states, in the face of outrage at workers being denied their pay. This response by organized labor, representing workers both in the affected unions and others, contrasts sharply to the weak response to and isolation of the PATCO air traffic controllers strike in 1981. The PATCO debacle took place at a time when pro-business, non-struggle forces dominated the leadership of the U.S. labor movement. They stood aside and held back the rank and file while Reagan fired 11,000 striking air traffic controllers and smashed their union. In contrast, in 2019, the actions of workers, with strong leadership and an energized rank-and-file action were decisive in backing down an anti-union president. Reports of call-offs, resignations and work by rule situations were heard. This response was the final nail in the coffin of Trump’s racist wall lock-out! The defeat of the Trump lockout is not only a watershed moment, it is a learning moment for our labor movement. Signs point to a new nationwide, even worldwide, wave of strikes and other worker resistance in response to corporate attacks and growing inequality. Government and teachers’ unions are demonstrating how to involve rank and file members, their families, and how to build wide community support in order to create new conditions where we can win. They are showing that workers’ strength is in mobilizing not just the members of one union, but of the entire labor movement, entire working class, community, academic, and legislative allies, to isolate our corporate enemies by all combining our power together.